Life has been ridiculously busy lately and I've obviously let this blog go by the wayside for a bit. I hope to properly pick it up again soon, but in the meanwhile this is a post I wrote for the StartSomeGood blog recently and I figured I should also share here. During February, thanks to the generous support of Renata Cooper and Forming Circles, I had the opportunity to attend two great conferences in Thailand and the US respectively where I was thrilled to meet changemakers and social entrepreneurs from at least 16 countries and learn more about their projects, challenges and insights. The trip started at the Ci2i Learn/Share Lab for Co-Creative Impact and Innovation outside Chiang Mai in Northern Thailand (I know, I know, it’s hard work this whole social entrepreneur thing sometimes). This was a very different sort of event from the norm: more intimate, focused and generative. It involved 25 of us living together for three days while exploring the practice of co-creative changemaking through a variety of case-studies and conversations. The participants had come from every continent on earth. Their stories and their commitment to a style of leadership which encourages participation, empowers others and shares successes were inspiring and very often moving. Many were working in incredible challenging environments, against entrenched systems of inequality, supporting refugees, the disabled or those seeking an alternative to business as usual. a belief that the process to create change is as important as the outcome. A belief in fact that empowering people through the co-creative process is an outcome. I learned about the incredible work of Edgeryders in catalysing new ways of thinking, working and living in Europe, of The Barefoot Guides out of South Africa, a co-created resource to deepen and develop approaches and initiatives that contribute to a changing world, of the struggle and progress of the Initiatives for Community Transformation in Uganda, as told by Peter and Grace, who had never left that country before (and who we will soon be supporting to run a campaign on StartSomeGood) and of Christina Jordan, our host and Ashoka Fellow, who has worked in Uganda and Belgium and now Thailand (and ran this campaign on StartSomeGood recently to support a refugee community) and is now spearheading the formation of Ci2i, a global community of co-creative changemakers. Then it was on to the US and, after a week of meetings in San Francisco and Washington DC, the AshokaU Exchange in Providence, Rhode Island. The Exchange was in some ways the opposite of the Learn/Share Lab: more expansive, relentless and individual. But no less inspiring and valuable. It brought together 800 people to explore how we embed and support social entrepreneurship on university campuses, split approximately 1/3, 1/3, 1/3 into students, faculty and funders. The students gave it a great energy, the faculty members shared incredible programmatic insights and the funders gave it gravitas and a sense of possibility. Together it was an exciting mix, with several concurrent streams of panels and workshops, short TED-style talks, banquets, small-group dinners and many side meetings. I was able to share the work we’ve been doing bringing traditional grant funding and crowdfunding together through our Crowdmatch model and present on how student-led projects can raise the funds they need to launch and grow. I’m hopeful we’ll be able to announce a US-based Crowdmatch partnership in the near future. The trip ended in NY where I presented at the first ConspireNY, a night of conspiratorial Pecha Kucha presentations. This was beyond nerve-wracking for me, as the requirements of the Pecha Kucha format (short talks with automatic slides, in this case 5 minutes with 20 slides which advanced every 15 seconds), brevity and perfect timing, are not at all my public speaking fortes. But given that I only prepared the talk that day (I was busy!) I was very pleased with the result and received great feedback. The video should be online soon. Thanks again to Renata and Forming Circles for making this trip possible with their sponsorship! I learned a lot, made new friends and contacts and am confident it will lead to some exciting new partnerships and projects for StartSomeGood, so watch this space! If you want to go fast go alone. If you want to go far go with others. I’ve been thinking a lot lately about the different experience between founding Vibewire in 2000 and StartSomeGood ten years later. There were some pretty amazing technological and social shifts during that time which I want to explore in a separate post. What I want to talk about today is, I think, the single biggest difference for me experientially between founding Vibewire and StartSomeGood and that is that with StartSomeGood I have a co-founder. While I had some truly amazing collaborators over the eight years I led Vibewire, I didn’t have a single person right from the start who was as committed, as on the line, as I was. Having Alex as my constant collaborator at StartSomeGood has been an extraordinary contrast. Even in the midst of our most stressful moments, and they’ve been many, having someone else that you can be completely open and raw with, who is as invested and committed to finding a way forward as I am, changes everything. Practically, of course, having a co-founder means you can do more from day one, allowing each of you to focus on different critical areas. Having two heads instead of one leads to more and better ideas. But most important, I think, is the way having a co-founder alleviates some of the stresses of startups by making those stresses shared, allowing each of us to express it and get it out rather than bottling it up, and the encouragement and support that comes from this. One of the keys to sustainability with a cofounder, and with a romantic partner as well for that matter, is compatibility in your freak-outs. One of you needs to be strong when the other is weak. If one person’s freak out triggers the other to freak out it’s just an emo mess. But it just seems that when I’m having a hard day and questioning everything Alex is strong and when he’s struggling I feel able to be practical and optimistic enough for the two of us, and so we continue. Judged solely in terms of the skills and experience we bring to the table we are not perfect co-founders. Neither of us is technical enough; our skills and preferences overlap more than is optimal. We have too really push ourselves to pick up and stay on-top of things neither of us is naturally inclined to do and, bless him, Alex has stepped up to more of that than me and kept the good ship StartSomeGood moving forward with his leadership and commitment, such as during the recent site re-build. But what matters most this skill-set match is our attitude match; it’s what makes it possible for us to work through the ups-and-downs of a startup together, even as we’ve never lived in the same place. I’m working near as hard as I ever have at the moment but there’s a lightness and satisfaction to it, a sense of progress and possibility and pride in our achievements. This is not simply from having a great co-founder but a great team, a group of people who share our vision and commitment to making it happen, who bring great energy and innovative thinking to their roles, who I trust to get the job done without supervision or micro-management. One thing I’m certain about: I’ll never launch a venture without a co-founder again. The difference it makes to your enjoyment, sustainability and ultimately your chances of success are just too great to set out on the epic journey which a startup represents without one. 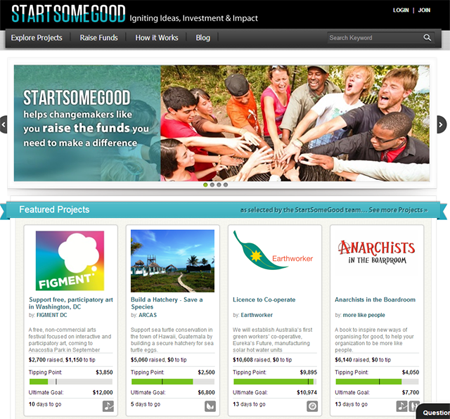 Welcome to the new StartSomeGood.com: It's time to start more good! In place of our usual newsletter we wanted to send you a personal email this week to let you know about some exciting changes happening at StartSomeGood and reflect on where we are. Most importantly and obviously we have just unveiled the new version of our site! The new site is a big step forward for us and we hope you like it as much as we do. The major changes include a lighter, brighter and friendlier design, with a simplified navigation which gives greater prominence to success stories and information to help you succeed at crowdfunding. On the back-end there’s an upgraded project dashboard to help you launch and manage your campaigns and we’re adding alternatives to Paypal for donors (already available to US ventures, coming soon for everyone else). But it’s not all about technology. We remain committed to a hands-on and partnership-driven approach which provides you with the advice and support you need to succeed. So if you have an idea for a project which can improve the future of your community, why not start today? Register on our site and a member of our team will be in touch to help you design a campaign which will succeed. Over the past two years, with your support, we have built a vibrant community of changemakers at StartSomeGood. Together, we have successfully funded 125 world-changing projects in 23 countries. We have supported social entrepreneurs as young as 16 and as established as Ashoka Fellows. We have helped launched projects as diverse as open-source mapping in Nepal to Sock Monkeys who fight cancer in the US, from social enterprise cafés in Cambodia to supporting young families in Australia and inspiring youth volunteering in 22 cities across America. While we are proud of these successes there’s so much further we want to go. Our goal is to launch 1,000 new social initiatives over the next two years, transforming millions of lives around the world. We would love your project, your idea, your community, to be part of that. Without you, we’re just a boring old website. With you, we can be an epic force for good in the world. So don’t wait any longer. If you have the drive and the passion to make a difference we want to help. Together, let’s start some good! PS. Read about the details of the new site and all the great activities we’re doing to celebrate, including a riddle hidden in the website and daily twitter chats this week on our blog. PPS. Speaking about getting started you may be inspired by the first episode of our new podcast series Starting Good, featuring Charles Best, founder of DonorsChoose. Check it out. You are running coach, the analogy goes, and you have to choose between two runners. One of them has textbook form, smooth and efficient in his stride. The other is a mess, straying out of his lanes, arms and legs flailing unattractively. Despite this they are neck-and-neck at the end of the race. Who would you want to coach? You would choose the worst runner, the guy with terrible form but who somehow managed to stay in the race despite this, because your coaching has the possibility to make the greater impact. You can’t do much with the guy with perfect form; he’s just not fast enough. But the sloppy guy, with refinement and coaching, might just be able to be really fast. In sporting parlance his ceiling is higher. I feel like that’s where we are at with StartSomeGood right now, as we stand on the brink of unveiling the new version of our site to the world. It’s been two years since the first version went live and, simply put, we have done almost everything wrong. We built the first version of the website with only conceptual feedback from our target market – we didn’t show them the actual site until it was live. We didn’t talk enough about what we were doing while we were building it, and so failed to prime the community for our launch. We didn’t even have a LaunchRock page up to collect emails, so we started with zero on day 1. We put far too much time and effort into coaching efforts which didn’t sufficiently move the needle. We recruited the wrong people and compensated them in an unstrategic fashion, giving away more entity than we should have to people no longer with us. We failed to test or monitor a lot of what was happening on our site. We were so tech-resource constrained I think it was too depressing to constantly focus what couldn’t, in the short-term, be fixed. We just worked harder and harder to connect with and serve entrepreneurs, but these efforts couldn’t all be scaled and didn’t overcome all the shortfallings of the site itself. This lack of attention to metrics and testing meant we didn’t have as much data or insight as we should have when we became (slightly) less constrained in our tech resourcing and were able to invest in this new site. But we’re still here. Along the way we listened, we learned. And now we are ready to show you some of those learnings embodied in this next iteration of our platform. We interact constantly with our community, social entrepreneurs and community benefit organisations looking to raise funds in a new way. We’ve been intimately involved in over 300 campaigns now, and have seen what has and hasn’t worked. We’ve been knocked back by organisations we wanted to work with and have always asked why. We recruited an amazing advisory committee LINK who have helped stretch and inspire our thinking, as have a wide range of informal advisers and friends. I can’t claim that we’re doing it all perfect now because we’re not. We’re busy and over-stretched and making compromises. The new version hasn’t had enough testing or rounds of user-feedback, but it’s had infinitely more than the first version. We would have done more but our updated UI/look-and-feel was done probono by Source Creative, who were lovely and generous and did a great job but didn’t have capacity for ongoing testing and additional rounds of tweaks, which was fair enough. It’s often better to put something out there and learn from how people actually use it anyway. Raising a small amount of family-and-friends investment has allowed us to get this new version shipped and we’re committed to being much more focused on testing and analytics than we were with the first version. There are a number of key improvements I’m excited to show you: • We’ve simplified our navigation and lightened the feeling of the site, giving it a cleaner and more modern look • We’ve put more emphasis on success stories and user-interactions, highlighting the people-powered nature of the site. • We’ve added alternatives to paypal, initially just for US ventures but coming soon for everyone else. • We’ve upgraded the venture dashboard, to help you launch and manage campaigns and; • We’ve improved the how to info and resources on the site to educate people about how to succeed at crowdfunding. So where are we as a business? I truly believe we stand on the brink of great things. Despite our abundant shortcomings we have built a vibrant community of entrepreneurs and changemakers. We have 10,000 subscribers to our newsletter, 10,000 followers on Twitter and 30,000 followers on Tumblr. We have successfully funded over 130 projects in 22 countries, and this is just the beginning. We have a fantastic, talented, passionate team spread Australia, the US, England and Sweden. Everyone is involved because they believe in our mission and are driven to scale our impact and help changemakers around the globe. You can meet our newest colleagues here. We have just announced a number of exciting partnerships, including with ING Direct who have committed significant funds to social entrepreneurs running campaigns on our site, and with the Global Food Startup Challenge, for which we are the global crowdfunding partner. In terms of our financials we have started slow but all sites of our sort do. Crowdfunding is boom or bust. Once you pick up pace it tends to accelerate, but the vast majority of sites never even reach the point we are at, remaining extremely limited in terms of scope or traction. I can understand the skepticism some feel about whether there is enough room for StartSomeGood in an extremely competitive crowdfunding market but I know we provide a unique service and truly believe we are the best home for most social entrepreneurs looking to raise money from their communities. The creative crowdfunding platform are simply not built with nonprofits and causes in mind. Our success rate (comparable with the creative crowdfunding sites), incredible partners and growing traction are strong positive indicators for this belief. So if you’ve been holding off on getting your idea out there and launching a campaign for any reason I hope you’ll reconsider and give our site a try. If you launch before April 2 you’ll be in the running for the ‘Like-Off’ we are running, with a bonus $200 grant to the project with the most likes during a 24 hour period starting at midnight April 3 Greenwich Mean Time. Please check out the new site and let me know what you think. Image by The Happy Rower made available on a Creative Commons license via Flickr. In Melbourne and curious about how crowdfunding can help you launch your project? Then this is your lucky week as I'm in town for not one, not two but FOUR crowdfunding workshops over Thursday and Friday. Two are introductory and free and two are masterclasses with (modest) cover charges, one focused on startups and the other specifically for social enterprises and nonprofits. Whether your dream of launching a social enterprise, a nonprofit, a tech startup or a personal creative project these workshops are designed to help you understand how to give yourself the best chance of crowdfunding success. The masterclasses will delve into the practical issues which will help you win at this new fundraising form: what rewards to offer, how to identify your audience, what's the right length for a campaign and more. Introduction to Crowdfunding, hosted by Social Traders and RMIT SEEDS, Thursday 1230-130 pm- only three tickets left! Crowdfund Your Startup Thousands!, Thursday 6-830pm, with me and record-breaking crowdfunders Fee Plumley, Rob Ward and Kylie Gusset. Only four hours left to get $65 tickets! Well worth the investment to hear from all these experts on how to raise funds for your startup. Crowdfunding for Social Impact, hosted by Social Traders and RMIT SEEDS, follows on from the introductory sessions, Friday 10am-1pm. A deeper dive into how crowdfunding can help you launch your social impact initiative, only $20. This also seems like a logical spot to mention that I'm looking to recruit a Melbourne Ambassador for StartSomeGood so if you love social enterprise, crowdfunding and helping people and think this could be a good time. Looking for a commitment of 8-10 hours/week. To find out more drop me a line at tom(at)startsomegood(dot)com.